Treat yourself or a loved one with this luxurious, all-in-one Honua gift set. Pa'akai Cleansing Cream: A naturally scented daily cleanser that creates a look of even skin tone and tightened pores, and leaves skin feeling completely refreshed. Blended with Hawaiian salt, aloalo (hibiscus) and limu (seaweed extract), this cream cleanser offers a deep feeling clean without leaving skin feeling stripped or dry. 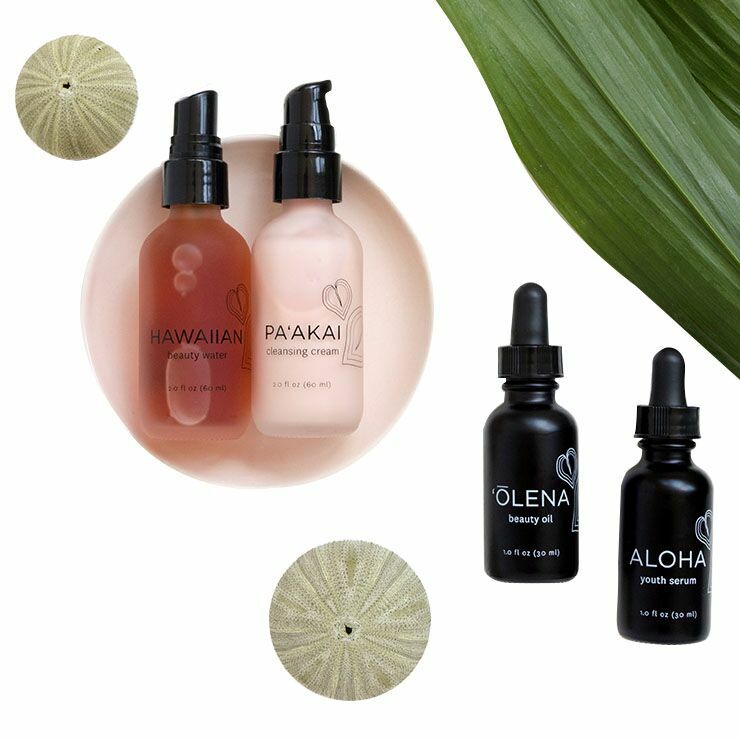 Hawaiian Beauty Water: Designed for all skin types, the powerful blend of aloalo (hibiscus), coconut water, Hawaiian sugar and papaya enzymes provide a refined, supple, luminous appearance. Aloha Youth Serum: This ultra-luxe serum is a blend of traditional Hawaiian botanicals used to make skin look healed and regenerated. Aloalo, the hibiscus flower and the native shrub of ‘awa, work together to create a firm and tightened look. While the herbal infusion of noni delivers a rich dose of vitamin C and the comfrey leaf gives skin the appearance of that coveted youthful Hawaiian glow. ʻŌlena Turmeric Beauty Oil: ʻŌlena, Hawaiian turmeric, tones down the appearance of inflammation on skin conditions like sun damage, eczema and acne. Blended with the ancient Hawaiian plant oils of kukui and kamani, these healing oils offer a feeling of hydration to the skin, while improving the appearance of elasticity. With the addition of antioxidant rich cacao, this multi-tasking super oil will leave you with a brighter, more supple appearance. I hadn’t tried anything from Honua yet but heard good things and I needed a new routine so I splurged on the set. I was attracted to it because of what the products claim to do, the fact that its a minimal line which I love, and obviously the beautiful packaging! I’ve only been using the system for a week and a half but am already noticing results. My acne scars are reduced, my skin looks brighter, and my skin feels more balanced. A bonus is that the cleanser surprisingly removes mascara better than any other cleanser I’ve tried. I wish beauty heroes would carry the Honua mask and hopefully the spf will be coming out soon as stated on the Honua website. Overall this set is my new favorite!